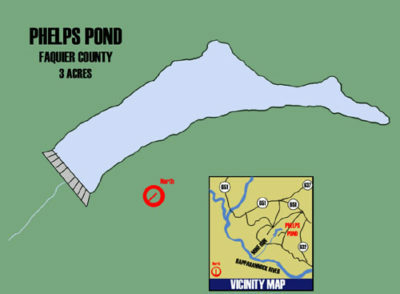 This pond is on the Phelps Wildlife Management Area in Fauquier County. It has largemouth bass, bluegill, redear, and channel catfish populations. The highlight here is the redear population, with recent surveys yielding trophy fish. The parking area is approximately 0.25-mile from the pond, and only carry-in boats are allowed. There is no boat ramp. Additional information about the lake can be obtained by contacting the DGIF Regional Office in Fredericksburg at 540-899-4169.